Controlling bed bugs is becoming an activity that more and more people around the world are having to deal with. Some are controlling bed bugs because they’ve had a prior infestation or are in the process of treating a bed bug infestation. Others live in areas with bed bugs, and work to control bed bugs to keep themselves from becoming infested. Do you have friends over to your house? How confident are you they don’t have a bed bug infestation? If they do, they just brought bed bugs along with them to your house. The good news? They don’t eat much. Do you use public transportation? You know that lady sitting next to you? See, she bought a really nice antique piece of furniture from an auction over the weekend and placed it in her home. What she didn’t know was that the furniture is infested with bed bugs and a few got in her purse this morning. Now they’re making their way to you. Might want to scoot over. Travel for business? That nice swanky hotel you stayed in last week for your business trip just showed up on the news. Guess what? They temporarily closed due to a bed bug infestation. Your room was one of the worst ones. Those bugs liked you so much, a few came home with you. I could go on, but I think I’ve made my point. Everyone is at risk for getting bed bugs. Fortunately though, you can control your risk and your chances of getting bed bugs. Whenever you return home from some place that could potentially have bed bugs (your neighbors house, from a trip, from public transportation) always go straight to the laundry room, remove your clothes and wash them in hot water. The hot water and heat from the dryer will kill any bed bugs your brought into the house with you. They keep bed bugs from getting inside your mattress, pillow or box springs where you can’t see them. If you have bed bugs in your mattress, pillow or box springs, the covers seal them in, and the bed bugs will eventually die. The white covers will help you be able to see signs of bed bugs more easily. While they won’t completely eliminate your risk of being bit, they do help reduce your risk tremendously. Repeat after me: “I will not buy used furniture“. Then say it 20 more times. Used furniture is notorious for being infested with bed bugs. Often the owners don’t even know it. We strongly advise you to just avoid used furniture all together, especially previously owned mattresses and couches. If you insist upon buying used furniture, please follow our process for checking it for bed bugs BEFORE you bring it in your house. Oh, by the way, you’ll want to avoid rental furniture as well. Since I run this site, I might be a little paranoid, but I check for bed bugs in our bedrooms monthly. That includes my wife and I’s bedrooms and all of our kids. 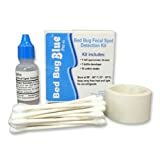 I won’t go into the details on how to detect bed bugs, but I would recommend you head over to our bed bug detection page and learn how to do an inspection. Why so frequent? The sooner you catch a bed bug infestation, the easier it is to treat and the sooner you can get rid of those bed bugs.